Saturday we went to Taipei with a friend to celebrate the end of Chinese New Year - the Lantern Festival. We visited the Chiang Kai-shek Memorial Hall first because we had read online that the lantern festival was being held there. Turns out it wasn't. 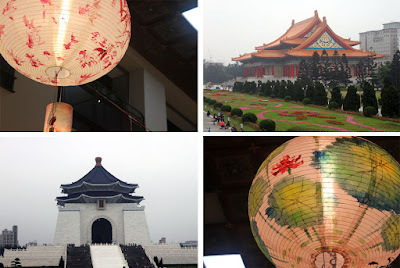 Since it was still light out, we walked around the memorial hall, saw some beautiful hand-painted lanterns and as it started to get darker we made our way to the real location - the Sun Yat-sen Memorial Hall. As soon as we stepped out of the MRT train we knew we were in the right place. There were tons of people and signs directing us to the right place. Just a short walk and we were there. I hadn't known what to expect, but I was thinking this festival would be along the same lines of the lanterns we had seen at the Chiang Kai-shek Memorial - traditional round paper lanterns. But what we saw here was totally different. 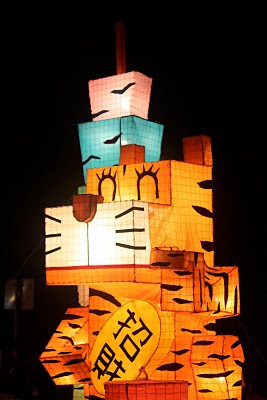 There were rows lined with huge lanterns made into scenes of animals (tigers especially for the year of the tiger), people, nature, etc. It was really very impressive. In addition to the lanterns, there was an area for people to write notes (wishes for the new year maybe?) and attach them to a big display or to some traditional looking red lanterns. It was a fun celebration; I'm getting used to this whole celebrating two sets of holidays thing! Wow, that must have been amazing to see, especially at night. My favorite is that boxy looking tiger... It looks like an animae character or something. Wonderful photos! I love reading about all of your new experiences! Thanks for the comments girls! J took the pictures, I agree they are wonderful!